Everyone, I’d like you to meet my new favorite salad. When we were coming up with new recipes for the mango class we thought some sort of steak pairing would be great. We had a marinade that we loved, and also a dressing, but when I went to put them together, the ingredient list just seemed too long and I wondered how the flavors would mesh. That’s when the light bulb turned on and I thought- duh! Why not create something that you could make once, and then use for both the marinade and the salad dressing. I’m all for make-it-once, use-it-twice recipes. This salad was born and the result was AmAzInG. We started by placing warm, tender steak slices on a bed of crunchy lettuce. Then we topped it with cool creamy avocado, bright red onion, cold juicy mango slices, and some sweet, crunchy caramelized macadamia nuts. All drizzled with a sweet and savory dressing that I just might be able to drink from a glass. It was a big hit with our class audience and I know it will be in your house too. You’ve got to try this one! Dressing/Marinade: No strangers around here! 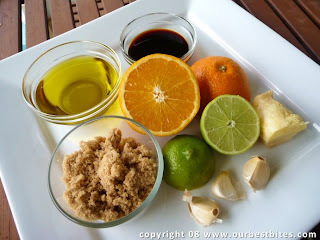 In a bowl, whisk together the orange juice, lime juice, soy sauce, brown sugar, ginger, and garlic. Whisk until sugar is dissolved. Continue whisking while slowly drizzling in the oils until combined. Reserve about 3/4 C* and place the rest of the mixture in a zip-lock bag. Lightly score the flank steak in a diagonal pattern on both sides. Place steak in the zip-lock bag with marinade and leave in fridge for at least 8 hours, preferably overnight. Caramelize the macadamia nuts. For instructions, click here. Remove steak from fridge about 30 minutes prior to cooking and leave at room temperature. You’ll want to let the dressing portion to sit at room temp during this time as well. Heat outdoor grill to med-high heat. If an outdoor grill is not available, use the broiler, or an indoor grill pan. Remove steak from bag and let any excess marinade drip off. Sprinkle steak lightly with salt and pepper. Cook for about 5-8 minutes on each side or until done. In order to stay tender, flank steak should still be pink in the middle, but nicely seared on the outside. When done, remove from grill and wait at least 5 minutes before cutting to let the juices redistribute. Then slice into thin slices. Now comes the assembly. 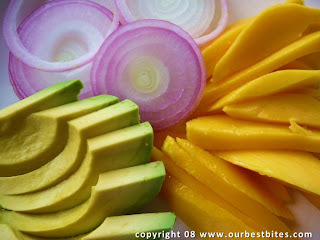 Divide lettuce onto plates and top with slices of mango, avocado, and red onion. I purposely chose these toppings not only for the perfect blend of flavors and textures, but for the gorgeous color combination- we eat with our eyes first! Add steak slices and drizzle with dressing. Sprinkle macadamia nuts and cilantro on top. Mmmmmm this looks AMAZING!!!! I am definitely going to be trying it in the near future! I am so sad I couldn’t make it on Thursday night. My hubby had a meeting that I didn’t know about until last minute and I couldn’t find a babysitter fast enough! I was disappointed, to say the least. I wanted to let you know that I passed on your French Dip recipe to a bunch of friends after serving it at a party, and all of their husbands are now in love with it. Thanks a bunch, ladies! This looks way yummy, and I don’t even LIKE steak! But I do love mangos. I’ve got a killer mango salsa recipe that everyone drools over if you’re interested (and have a whole to fill for mango week). hands down best salad ever! WOW. This looks sooo yummy. I am making it this week for sure. I wish I would have read this before I went and blew this week’s food budget this morning!! I’ll definitely be trying this next week. After trying this salad at your shindig on Thursday night, we made this for dinner last night to rave reviews! Thanks. We did have one problem with it though…what did I do wrong? We had a problem with caramelizing the nuts. Can you clarify how to do this the RIGHT way? Yum, my mouth is watering now, lol. Looks Delicious!! Patti- caramelizing plain sugar can be a bit tricky because there are lots of variables that can mess it up! Kate and I even had issues with the ones we made for the class. I came up with a way I think is much easier, and I just wrote a tutorial about it (your wish is our command! )and posted it right after the steak salad post. It has step-by-step photos as well. That should help! I didn’t know I had such power in my wishing! Thanks so much for the step-by-steps on the nuts. We’ll give those nuts another go (and it’s nice to know I’m not the only one that had issues with this). I made this for dinner tonight and it was awesome…the combination of flavors was perfect! It’s definitely a keeper! This salad sounds so good! Unfortunetly, like Sara and sea food I have a really strong gag reflex when it comes to onion. Just the slightest hint of them makes me wretch. 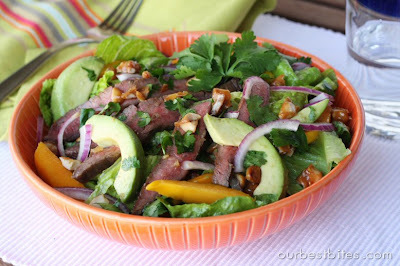 I always just leave them out, but this salad might be lonely with just steak and mango. (oh yeah, cant do avacado either…although I think I might have to give it another try. I make a habbit of trying things over and over just incase my taste buds changed) So the questions is can you think of other things to add to this salad to make it full again? You should try adding sweet corn, roasted red peppers and maybe even some cucumbers. Or maybe grilled pineapple. The possibilities are endless. Salad recipes are good, but I always use them more as a template for my own creativity. If you don’t like onions you should try using shallots. Shallots taste somewhat like an onion, but they have a sweeter, milder, and yet richer flavor. You could just mince one up and add like a 1/4 teaspoon of it to the dressing. Shallots look like they would be a great addition to this dressing, I’m going to try it myself. This looks delicious! You could even make a finer chop and use as filling for tacos! Can’t wait for the market to open tomorrow morning….going to make these for lunch! You rock! This salad looks so good! I’m going to try it with some red peppers. I just can’t decide if I want them crunchy and raw or roasted. Yum! This salad is SO darn good, I could eat it every day! Thanks! Oh… and we dressed ours in homemade cilantro ranch dressing. I would recommend trying it like that! I made this again last night. To-die-for. My daughter loves cilantro as much as I hate it. I bought some for her to put on her own salad, but she had to sit on the other side of the table from me while we ate so I wouldn’t have to smell it. The good thing about this salad is that each plate can be individualized! And the meat- oh, the meat. So, so, so good. Okay, I think I’ve said enough. I made this for dinner tonight. It was AWESOME. This is my all time favorite salad. I could eat it everyday. My favorite version is with the steak but it works well with chicken too. I chunk everything because I think it is easier to eat. And I normally caramelize cashews because I always have those around. The dressing is to die for, I love soaking up the extra on my plate with some good artisan bread. Thanks for the delicious recipe!